Looking for a deeper understanding of electromagnetic wave propagation? Need a resource of practice problems to hone your skills? With 272 selected problems and answers, this study aid is a powerful supplement to the study of wave optics. Covering the basics of wave propagation, reflection, refraction, anisotropic media, interference, diffraction, and coherence, this question-and-answer collection provides the opportunity to solve problems chosen by a mentor with decades of experience instructing students. Whether you're a professor needing representative exam problems, a student learning the field of optics, or an experienced engineer looking for a better grasp of the field, you'll find this supplement of focused problems helpful. 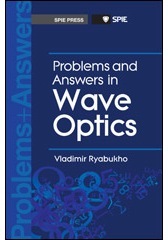 This collection presents problems related to a wide scope of wave phenomena in optics, studied within the framework of the university course of general physics. The problems cover the basic topics of wave optics, i.e., electromagnetic waves and oscillations of optical range, spectral properties of electromagnetic waves, polarization of oscillations and waves, reflection and refraction of light, total internal reflection, optics of anisotropic media and crystal optics, interference of monochromatic and mutually coherent waves, temporal and spatial light coherence, interference of partially coherent light, multiple-beam interference, diffraction of light, diffraction gratings, diffraction of light by volume gratings and acoustic waves, optical holography, and optics of moving media. This book is written as a supplement for students studying physics, mathematics, and engineering, including medical physics and engineering, biomedical optics, and biophotonics. The problems are chosen such that their solution supports the study and understanding of the basic concepts of wave optics. This is why the collection contains a sufficient number of relatively simple problems for each topic. Paired with any popular optics textbook, these problems illustrate the principles learned from lectures and lab work. The content of some problems allows them to be used for self-training. Many problems are accompanied by schematic illustrations for clarification, since the study of optical problems is largely associated with visual-spatial perception. What follows is the result of more than 20 years of experience teaching optics to students at Saratov State University. I greatly appreciate the cooperation, contribution, and support of all of my students, postgraduate students, and colleagues from the university's Department of Optics and Biophotonics, especially from the head of the department, Professor Valery Tuchin. I am indebted to my colleague Vladimir Derbov, a professor in the Department of Theoretical Physics at Saratov State University, for his English-language assistance. I appreciate his fast and high-quality translation, and his spirit of fruitful collaboration. I would also like to express my gratitude to my wife, Anna, and my son, Peter, for their indispensable support, understanding, and patience during the writing of this book.